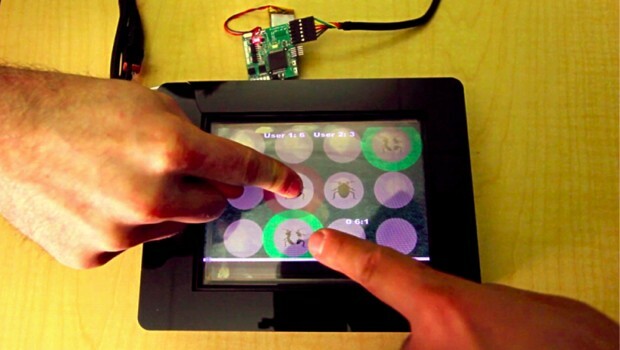 Creating a truly multi-user, multi-touch display is a tricky prospect. How do you know who's who short of turning the screen into one giant fingerprint reader? Chris Harrison, Ivan Poupyrev and Munehiko Sato at Disney Research have suggested in a paper that fingerprinting on a capacitive touchscreen isn't far off -- it's just what we need to fingerprint that matters. Rather than look for physical ridges, the scientists' method sweeps through AC frequencies to find the exact electrical impedances of fingertips in contact with the screen. Different bodies, different clothes and even different shoes give everyone a unique signature that lets the screen identify specific people, even when they each have multiple fingers in play. The researchers propose that the technique would work well in collaborative workspaces, personalized devices and security, but let's not forget that this is Disney we're talking about: it's placing a strong emphasis on the prospects for shared screen gaming without the limitations we know today. While any practical use is still some distance away, it's easy to see future tablets and tables that are designed from the start to encourage a little socializing. Disney Research develops capacitive touch that detects multiple users through their fingertips (video) originally appeared on Engadget on Tue, 09 Oct 2012 16:29:00 EDT. Please see our terms for use of feeds.